Because a ride to the start of the Würzjoch/Passo delle Erbe would mean a 20 kilometer descend to Piccolino to start with, I decided to pick that stage for today. It would also involve the “whole nine yards” of the Gardena, from Ponte di Gardena. Only two climbs – sounds like a rest day, right? The first 2.3 kilometers average 11%, but if I get a dime for every 10 meters of 15%, I can afford another jersey (I’ll get to that) as there are more of these stretches to enjoy later on. Anyway, I wrestled my way up this pass too, only to be met by thunder, lightning and heavy rain immediately upon reaching the summit. I decided to descent on the bike anyway, but that turned out to be a bad call. When we finally reached Bressanone, I was soaked and chilled to the bone, my hands and feet were numb (which made braking during the descent difficult) and I needed to warm up in a restaurant for a while. 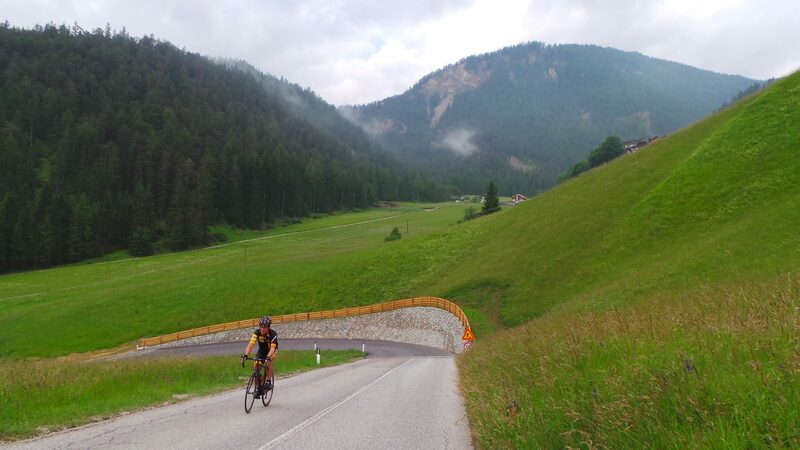 After having changed into dry clothes too, I couldn’t immediately find the right track, but after riding back-and-forth a couple of times, we eventually found the route to Ponte di Gardena, where I started the climb of the Passo Gardena. By the time I hit the 14% stretch there, I was more than done and shortly after that it started to rain again too. I shopped for dry clothes – a jersey and an undershirt – in Selva di Val Gardena, in the same shop where I bought some stuff 4 years ago. When I finally reached the summit, it was pouring rain again, but instead of doing the sensible thing and get in the car, I stubbornly decided to go down by bike. Needles to say I was unable to speak when we reached the apartment, even if in Corvara it hadn’t rained at all and I soaked under a hot shower for 30 minutes to get everything back in working condition again. Let’s see what tomorrow brings – all bets are off.